A FaceBook friend offered up an interesting and easy way to insulate windows, without having to replace them altogether with a company like Otto’s Exterior, as the weather gets colder, that should work very well for everyone whose homestead living quarters isn’t fully outfitted with double-paned windows. I’ve been doing the way too labor and staple-intensive job of covering windows every year with plastic sheeting, then taking it down again in the spring so I could let some fresh air in. And sometimes managing to get all the staples out of the wooden frames, leaving lots of little holes that make it ever more difficult to re-insulate in later years. Don’t know why I didn’t think of this, but thank goodness someone did! It’s all about Bubble Wrap, which can be purchased by the roll at many retail and hardware outlets, or recycled from your own saved packing stash of “stuff you might need someday” that’s taking up way too much room in the attic or shed. And not only does the actual insulating material (bubble wrap) make great insulating sense, the method of getting it onto your windows does NOT require any staples or tack-tape! No-holes has a lot going for it in the home preservation department, for sure. • Cut the bubble wrap to the size of the window pane. • Spray a film of water on the window using the spray bottle. 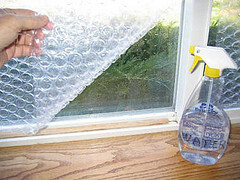 • Apply the bubble wrap while the window is still wet and press it into place. • To remove the bubble wrap just pull it off starting from a corner. Voila! Well-insulated windows! The bubble side should go next to the glass for best results. If you wish to get a good view out the window pane for any reason, just pull off the bubble wrap from the corner, and then re-apply with the water sprayer when you’re done. After removing you can put your pre-cut bubble wrap window insulators into a box or bag for use in following years, just hide it from the bubble-popping kids. In my very rural neighborhood with lots of small-acreage homesteads that have been going for generations, there is a lumber mill. Belongs to a neighbor, mostly just a big-timber circular saw and carriage under a sturdy roof with no walls, stacked hardwood logs he and his several sometimes/part-time workers have salvaged from acreage nearby being cleared for building and/or farming. For some years his main business was ‘machining’ those logs into the makings of log homes – from small cabins to big McMansions – for a local log home outfit that has since suffered the results of recent economic and real estate troubles. Oh, he’ll still process logs if you really want log walls for a house or cabin you’re building, but mostly his mill has been silent lately. One of his backhoes is down, though his big front-end loader is still working on some development acreage a bit south of here. We’ve contracted him to do a big job on the steep front end of our half-mile driveway, the culverts of which were crushed by heavy railroad machinery years ago. That means that whenever we or the railroad whose access IS the front section of our driveway pay to have the thing re-graded after a season’s hard rains send most of the gravel into the road down below and carves deep canyons that’ll wreck the underbelly of any non-4WD vehicle, we can be assured that the next hard rain is just going to tear it up again. He also gives us the half-round slicings off the logs that he does mill, which are excellent wood stove fodder during the cold months. But seeing his mill idle so much of the time these days is sad, in that none of us locals are very rich even during boom-times. And I’ve wondered what other things a person could do with a homestead sawmill that could tap into the still-strong rich-people retirement and vacation home market in this area. Son-in-Law has a nice wood shop in the next county north, as he is a master cabinetmaker and woodworking artist when he’s not teaching sculpture at the area’s Community College. Has all the routers and lathes and fancy edger-type machines that can turn hardwoods into cabinets or fine furniture or anything else that can be made of fine wood. 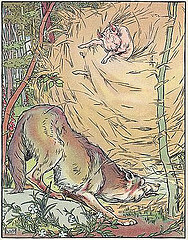 In fact, there are quite a few fine furniture woodworkers in these mountains, as it used to be how the region earned outside money – Hickory, Drexel-Heritage, Ethan Allen… all the big names in expensive generational-quality hardwood furniture before the industry closed up shop and moved to China because Americans couldn’t afford it anymore. When I went looking around, I found several good sites dedicated to the fairly “new” industry of salvaging ancient logs from the rivers that were used when the country was young to float harvested timber to the mills. Seems that cold water preserves this old growth timber very well, and when long-lost logs salvaged from the riverbottom mud are brought up and carefully dried, it offers some of the very finest hardwood to be had anywhere outside the virgin wilderness that cannot be logged. For at least two hundred years the rivers in our country were used to raft logs from one place to another. The trees were cut and stripped of limbs, then tied together to float downstream to a mill. Many times the river would be running high and fast, and when these rafts hit rapids they broke apart. Many logs were lost to the rivers, where they waterlogged and sank into the mud on the bottom. The cold water preserved the logs – often harvested centuries ago from virgin old growth, and now they can be used to make fine furniture and hardwood flooring with grains that simply cannot be matched by today’s early-harvest tree farms. Even better for the few with the salvage and transportation equipment, the furniture and wood flooring that can be made from the logs commands a very high price in today’s markets. Here in North Carolina salvage timber companies are mining rivers on the coastal plain of the Neuse and Cape Fear, but the bigger rivers just over the Continental Divide – which drain into the Tennessee and eventually the Ohio on their way to the Mississippi have so far escaped the big salvage outlets. Even three or four fine timber logs salvaged and trucked here to the mill and finishing shops would bring a pretty penny to the homesteaders who cared to take advantage of the opportunity. In the sounds and bays where timber once formed walkable surface from shore to shore, thousands of such logs wait to be mined. Wired had a 3-page story on this new industry called Reservoir Logs that detailed the salvaging and eventual end use of these precious old growth logs. If you’re on the shoreline or live nearby, underwater timber harvesting is remarkably quiet: no screaming chain saws or smoke-belching heavy machinery. In a steady, splashing procession, tree after tree bobs to the surface, where a small tugboat rigged with a pair of hydraulic claws grabs the trunks and tows them into something called a bunk, a partly submerged U-shaped cradle. I can see three bunks from the barge. Each stores up to 300 trees and can be raised onto a second transport barge that holds up to 1,000 logs. The Sawfish and its four-person crew will fill it in just four days. Ah. The crafting of fine instruments from dulcimers to dobros to banjos to mandolins and violins has a storied history and a vibrant present in this region of True Bluegrass and traditional mountain music. Desert Rose investigated the product, and had the wood totally tested by an independent government laboratory. Its certified results documented and fully supported the claims circulating about the density, strength-to-weight ratio, modulus of elasticity and all other industry specifications. Moreover, the acoustic performance characteristics of the wood were measurably superior to land-harvest woods for making fine instruments and wind harps, wind chimes, tongue drums and vibes, etc. A single old growth salvaged hardwood log – say, maple or hickory, cherry or white oak – could make dozens of instruments, a few two-octave vibe keys, as many wind harps as any major estate could afford, and still have enough left to turn into a matched dozen fine Windsor dining chairs plus 24-foot table. For those interested in researching this opportunity, check out some of the old growth timber flooring and veneers offered by such companies as Aqua Timber. And remember that salvaged old growth timber is environmentally friendly! The poet Henry David Thoreau escaped to Walden Pond to find wisdom and serenity. Most of us would love to do the same thing, if only to find a few hours of peace. But we have no Walden Pond and most of us don’t even have a few free hours: we have things to do, emails to answer, deadlines to meet, and a never-ending to-do list that leaves us frazzled and unhappy. But in what Thoreau so aptly called “lives of quiet desperation” the need for a sanctuary becomes even more important. And since we can’t pack up our things and go to a deserted woods, the next best thing is to create a quiet, peaceful nook in our own home. In a pinch, that can mean a locked bathroom. But the gold standard of escapes—and if you can afford it, why not?—is a conservatory. A conservatory isn’t just a room with a lot of big windows. It’s Walden Pond with indoor heating and a comfortable sofa. We enjoy all the most healing, soul-fulfilling aspects of nature—the beautiful view of the garden, the golden beams of sunlight, the clear blue sky and slow ambling of summer clouds—while in the comfort of our own home. The conservatory can be our personal heaven on earth. If we love books, we can turn it into a library or reading room. Or it can be dining area, and between meals, use the table for work, crafts, writing in a journal, or even a dull task like sorting through emails—somehow, the drudgery is more bearable when we do it in a happy place, surrounded by comforting things. 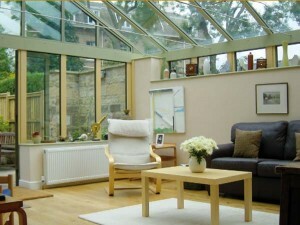 While a conservatory sounds horribly complicated and expensive to build, it’s not. Modern man has something Thoreau did not: DIY or self-build conservatories. And considering the cost of therapy and stress medication, we will probably save more in the long run. We need a sanctuary. No, let’s put that more strongly—we deserve a sanctuary. There are numerous studies on the healing effects of silence, nature, and even just a few moments of sitting a in a sun room, surrounded by a garden view and bathed by sunlight, can do wonders not just for our physical health but our emotional well-being. So while real estate agents will say that a conservatory is good for your property value, perhaps the best reason to build one has nothing to do with what money can’t buy: peace.